In the first company we met Luis, he presented us what they do and how they work, he is an engineer and the current sales manager. He is a part of the fourth generation, because this company has been operating 106 years. We walked to the warehouse and Luis showed us the different areas and how it was distributed according to the products that they offer. Luis also showed an example of the delivery note they use to control the products in every delivery. The distribution of the storehouse was properly done according to the percentage of sales, locating the most popular products at the front part of the selling desk and the other materials at the back. 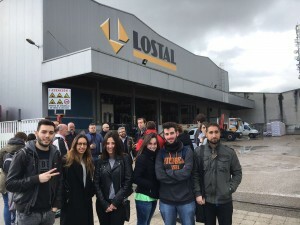 Lostal is associated with other construction companies from Spain in order to improve their profits and make an exclusive brand (Maxlor). After that we saw the exhibition of some of their products such as toilets and tiles and the room where they give classes to teach new technologies and give training to their employees. Then we went to another area in which we saw more construction materials, after that we visited the last company called Selcansa. We arrived at another industrial area where a man called Javier explained us two important aspects regarding their distribution system and how they manage the storage. The first thing we saw was the area where customers orders were prepared and how they worked with DHL as a collaboration to transport the final products to customers. At the back of the storehouse they da cable reels with a monitoring system that avoids pollution, the rest of the materials where located on shelves at the front part and at the level upstairs; their offices were also at that level. In conclusion the visit was very interesting for us because we learn about the process of this two companies and it can help us know the difference between the theory and the practice.